New-look January 2016 issue on sale now! | What Hi-Fi? New-look January 2016 issue on sale now! What Hi-Fi? 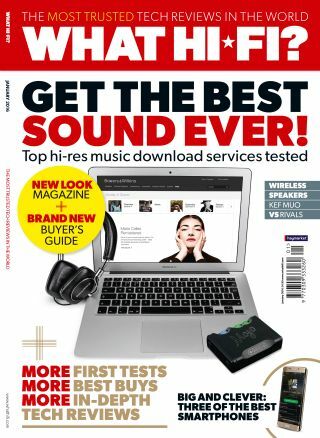 magazine has had a complete design overhaul just in time for Christmas, making it the perfect gift for the audiophile in your life. There are more First Tests than ever and the Buyer’s Guide has been improved to help you make the best buying choices. The first issue sees a Group Test of HD download services, four supersize smartphones going head to head and a giant Sony TV complete a must-read issue! If you turn to the Buyer’s Guide at the back, you’ll notice the second biggest change. We’ve taken out a lot of old products that we feel aren’t relevant anymore. Instead, you’re now presented with the just the best, most recent kit that we think deserves your money. Our First Tests section is bigger than ever, with more in-depth reviews than before. Key features of each product on test are represented by icons to make it easier to single out the products you’re most interested in. In this month’s issue we start proceedings with a superb flat 4K OLED from LG, which is perhaps one of the best TVs we’ve ever laid eyes on. We’ve also given Google’s Chromecast Audio streaming dongle a thorough going over. At the time of writing, Google hadn’t implemented a multi-room audio upgrade, but the company has recently confirmed it’s now possible to pair several dongles together, as well as stream hi-res audio. Of course, it wouldn’t be an issue of What Hi-Fi? without some Group Tests and this month is no different. If you’re in the market for a hi-res audio download service, as opposed to a streaming service, then you’d best pay attention. We’ve pitted seven of the best services against each other, testing them for catalogue quality, audio quality and ease of use. Large-screen smartphones, or phablets, are becoming increasingly popular. We’ve taken four of the best examples from Apple, Samsung, Motorola and Google to find out which is best. Can any of the contenders steal the Award-winning crown from the Samsung Galaxy S6 Edge+ or will it remain top of the pack? All is revealed. Wireless speakers are always a hot category as the market is constantly flooded with models of different shapes and sizes and with varying features. We’ve brought together three from KEF, Sony and Libratone, all of which have something the others lack, but which one is the best all-rounder? We decide. We’re huge fans of vinyl at What Hi-Fi? Not only do we love the fluid analogue sound, but we also appreciate their look and feel. We just wish we could take a record player with us on the morning commute. Fortunately the technology is now in place to be able to digitise your record collection. We run through everything you’ll need to get your vinyl collection on to your computer and then to your portable music player. With CES 2016 just around the corner, we take a look at what tech and trends we expect to see in Las Vegas in January at the world's biggest technology show. Finally, we finish with our illustrious Temptations section, showcasing the very best tech money can buy. This month we’ve got a sensational CD player from Burmester and a huge 75in 4K TV from Sony. Do their price tags reflect their performance though? And don't forget, you can download the digital edition of the magazine directly to your PC, smartphone or tablet at any time. Happy reading!